PC709 Chakra stones pendant. Semi-precious stone chips corresponding to each of the seven chakras are layered in a glass tube and wrapped with a sterling silver wire. Earrings with the stones of the seven chakras. Sterling silver chakra earrings with semi-precious gemstones: garnet, carnelian, citrine, peridot, apatite, iolite and amethyst. Chakra stones pendant with meditating figure on top. 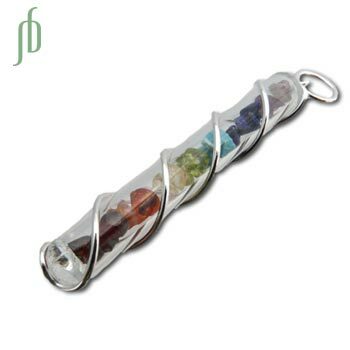 Semi-precious stone chips corresponding to each of the seven chakras are layered in a glass tube with a sterling silver top and bottom.